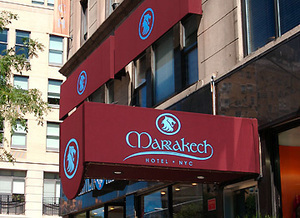 Located on the Upper West side, just 2 blocks from Central Park, the Marrakech hotel is a tranquil and friendly place to stay if you’re ever in Manhattan. With its Moroccan decor and plush furnishings, it’s a world away from the hustle and bustle of downtown New York City (which is easily accessible by the subway station just outside the hotel if you decide you do want some of that madness after all). 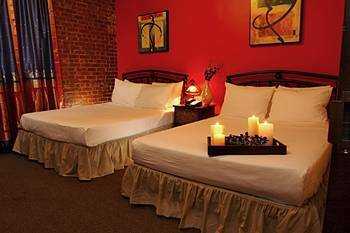 The hotel offers 3 different room types – Superior, Deluxe or Double. We opted for the double (as there were 4, *ahem 5* of us) and it was plenty big enough for all of us plus our 10 bags. The beds were comfortable, the bathroom was clean and tidy (if a little small), with all the usual amenities (towels, hairdryer, shower gel etc) and an amazing shower…no seriously, it was awesome. We weren’t there for very long so can’t make much comment on the rest of what the hotel had to offer, but I do know they have a bar downstairs with happy hour during the weekday evenings, and free internet and computers in the lobby – there was supposed to be free wifi too (a must-have in my opinion), but unfortunately it wasn’t working during our stay, which is my only negative about this hotel…a very minor downside! I really enjoyed our stay here at the Marrakech, and I would most certainly like to stay again, for longer next time.